TACLOBAN CITY-For John Wayne Regis, 17, playing football becomes his ultimate drive to continue living and eventually winning in the game of life after supertyphoon Yolanda flattened this city and killing over 2,000 people more than four months ago. “Playing football changes my life. The sports give me the chance to get a good education. When typhoon Yolanda came, I thought my hope and dream will be also gone, but then help arrived,” Regis told Leyte Samar Daily Express in an interview. The same also happened to Regis’ teammates like Janry Villalino, Jade Nicole Lapena, Mark Gesulga, and Jonel Cablaw, this as the United Nations Development Programme (UNDP)and the Switzerland Embassy launched a short film “The Football Wonder of Tacloban” by renowned Swiss filmmaker Michael Steiner to raise awareness and support “to help meet enormous recovery needs” across the Yolanda-devastated areas. “My father is a football player and he is the one who teaches me about the game since I was six years old,” said Regis, who is the eldest of five siblings in their family. Regis added that after Yolanda hit Tacloban, his father found a job through the cash-for-work program of the UNDP. Even before Yolanda, football is extremely gaining attention in the country particularly Tacloban, home of Dan Palami, the coach who propelled the national football team Azkals into world stage of football sports. Azkals’ success has inspired several of the Philippines ‘ rising football stars like Regis who also got shot of fame in football sport with the 1st division Global Football Club. The “Football Wonder of Tacloban” had its launching in Manila last March 6, two days after a short version of the film was showcased in front of the 21,000-strong crowd that turned out for the international football “Match against Poverty” in Bern , Switzerland on March 4. The match, along with the one-minute film, was beamed to 74 countries around the world, including the USA, Brazil, France, Indonesia, Australia and the Philippines, which will broadcast it over the coming week, according to UNDP. 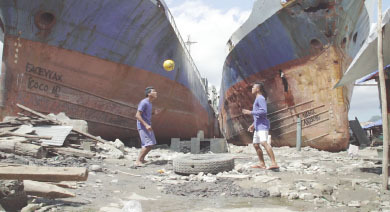 “By telling the story of how the typhoon devastated the lives of local football players, I wanted to tell the story of an entire region,” according to filmmaker Steiner. “There is still a long way to go to rebuild and we need to keep reminding everyone that people in Visayas need their support,” he added.